M. Jules Remey : Redwood Floatsam on Ohau, 1839. 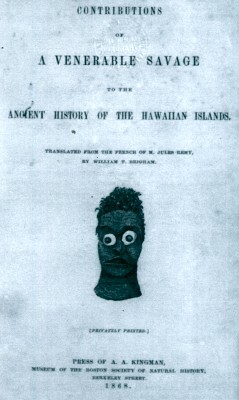 Contributions of a Venerable Savage to the Ancient History of the Hawaiian Islands. Translated from the French by William T. Bingham. Press of A. A. Kingman, Berkley Street, [Boston], 1868. A Although there is no direct account of surf riding, Remey does note the arrival of "two immense logs of the Spanish cedar" (Californian redwood) which the local Hawa'iians are turning into bulding materials. These timbers were highly valued by the Hawai'ians, large ones were used for canoes, smaller logs may have been used for the building of surfboards. Notes on a Tour around Oahu. Our stay at Kaneohe, and also on the eastern part of the island, was necessarily short; we could not, however, but notice, that most of the inhabitants on the eastern end of the island were much more degraded, and exhibited far less evidence of improvement than any we saw on the other parts of the island; a fact calling for our sympathy and pity, and for our endeavors to enlighten and elevate them. At almost the extreme eastern point of the island we observed two immense logs of the Spanish cedar, which had been thrown upon the island by the waves. The natives were cutting them up with pit saws, for building purposes. Having been wafted to these islands from the western coast of America, their voyage could not have been less than 2,500 miles. How long they were in performing it, there is no possibility of knowing. They were considerably perforated with worm holes as large as a man's finger; and exhibited the appearance of having been long in the water. Their arrival here will not appear so wonderful, when we reflect that these islands lie directly in the track of the trade winds, which blow from nearly the same point of the compass for months together, and indeed for the greater part of the year. Their happening to land upon the island, is, indeed, surprising, as it is but a mere speck, compared with the vast extent of the Pacific over which they passed, and which surrounds us on every side. Geoff Cater (2012) : M. Jules Remey : Redwood Flotsam on Oahu, 1839.